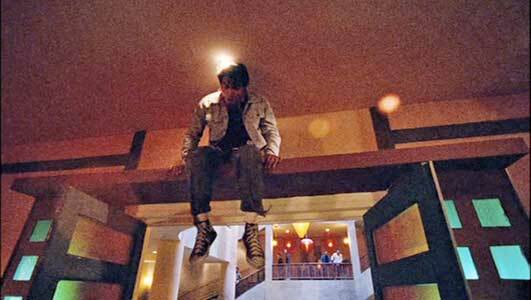 Tony Jaa wears black high top Converse “Chuck Taylor” All Stars in the film. Kham’s mission in life is to protect royal elephants. 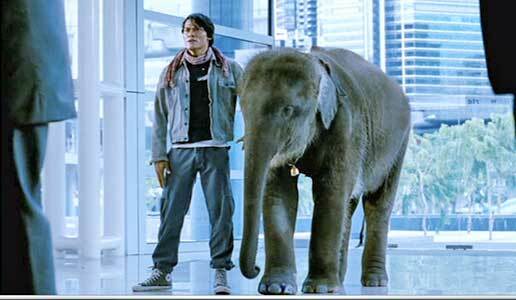 Kham (Tony Jaa) is the last of a family line of protectors, watching over the King of Thailand’s war elephants. Kham grew up forming a bond with his elephants, the adult Por Yai, and the calf, Kohrn. Only the most perfect elephants were chosen to defend the throne, and very great care was taken in raising them. As a result, these elephants were prized targets for elephant poachers. The action part of the film begins at a local festival. Kham’s two elephants are stolen by poachers working in collaboration with bribed local authorities. Kham hurries after them, but is too late to prevent their capture and transport out of the country. Kham does find out that the two elephants have been taken by Johnny (Johnny Nguyen), a Vietnamese gangster who operates a Thai restaurant called Tom Yum Goong Otob in Sydney, Australia. Kham vows to recover his prized elephants, mo matter what the cost. Kham takes on mob enforcers at Johnny’s hideout. Kham travels to Sydney, and is followed by two police officers, Mark (Petchtai Wongkamlao) and Rick (David Asavanond), as soon as he leaves the airport. Kham coerces one of Johnny’s men to bring him to Johnny’s hideout, interrupting a drug deal in the process. 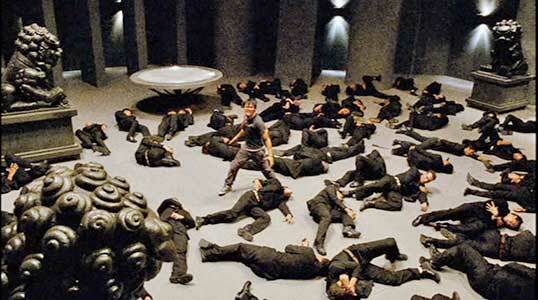 Outraged, Johnny summons a group of amateur fighters, who arrive to attack Kham in a parking garage. After fighting them all off, Kham is exhausted and falls asleep in an alley. Pla (Bongkoj Khongmalai) finds Kham and brings him to her apartment. Pla is a former worker at Johnny’s restaurant, very much disgruntled by what goes on there, and willing to help anyone who will take Johnny on. After Pla leaves for a meeting where she will act as a hostess, Kham wakes up to the sound of police sirens and must escape from the apartment. At the meeting, Mark and Rick have been assigned to be security for Mr. Sim and the Police Commissioner. Another policeman on the take, Vincent (Damian de Montemas) murders Mr. Sim, the Commissioner, and Rick, setting up Mark to take the fall. Mark escapes, but is captured later by Johnny’s men. Pla manages to escape also, taking a camera phone that contains evidence of the murder with her. She is saved from the police by Kham. Pla tells Kham that she used to be a waitress at Tom Yum Goong Otob and reveals that there is a secret VIP area in the back of the restaurant. Kham hides on top of a door frame, waiting for his attackers. With Pla’s help, Kham enters Johnny’s restaurant. He fights his way into the VIP area and reaches the dining hall at the top. Kham demands to know where his elephants are. Johnny and his men laugh at Kham and taunt him with Korhn’s bell. Enraged, Kham attacks and defeats his opponents in another spectacular martial arts sequence. Kham enters the secret VIP area, which contains various exotic animals ready to be butchered and eaten by the unscrupulous patrons of the restaurant. Kham finds and frees Mark and Kohrn, escaping minutes before the police arrive. But Kham’s mission is not over yet. A new opponent emerges, Madame Rose (Xing Jing) who has just become the new leader of the Chinese gang after she murders two other possible successors. When Kham finds out that Por Yai is in her hands, he comes out of hiding in a Buddhist monastery to take her on along with her body guards, two martial arts masters and a giant wrestler. Kham must fight each one individually in amazing one-on-one fight sequences. The fight against Madame Rose, the resolution of the case against Mark, and the pursuit of Por Yai make up the remainder of the film. Kham has successfully taken on a roomful of opponents. Martial arts superstar Tony Jaa puts in an incredible performance as young Kham, taking on dozens and dozens of assailants throughout the course of the film. Originally titled Tom-Yum-Goong, the film was distributed as The Warrior King in the United Kingdom, as The Protector in the United States, as Thai Dragon in Spain, and as Revenge of the Warrior in Germany. With his collaborator Panna Rittikrai, Tony does all of his own stunt work in the film. The story line could have benefitted from some trimming and more simplicity, but in these films, the story is just a set up for the staging of the martial arts sequences. If you enjoy that type of film genre, then you will like this movie a lot. 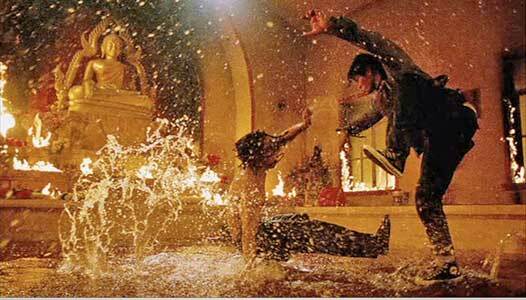 Kham takes on a martial arts star in a water and fire fight. Kham escapes from his attackers in a parking garage. 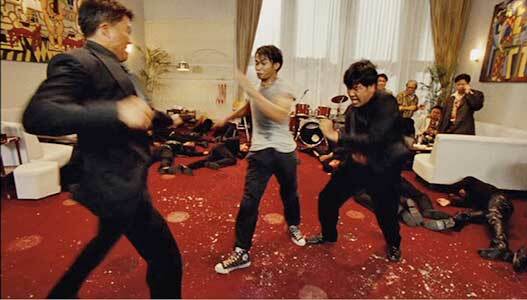 Tony Jaa wears black high top chucks throughout this film and they are featured in all of the fight sequences. 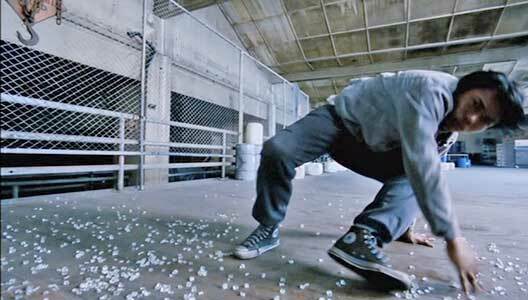 It’s great to see chucks in an action adventure martial arts film as the favorite shoe of the main fighter. The camera work is chucks-friendly so it is hard to define just one great scene. Here you can see two good closeups, one in the parking garage and one in the fight sequence with the giant wrestler at Madame Rose’s headquarters. Kham’s foot is grabbed by an opponent. The Protector. (2005) Tony Jaa, Petchtai Wongkamlao, Bongkoj Khongmalai, Xing Jing, Nathan Jones, Johnny Nguyen, Lateef Crowder, Jon Foo, Damian De Montema, David Asavanond, Sotorn Rungruaeng. Directed by Prachya Pinkaew. Categories: Action/Adventure, Crime.